Arab Israeli from Umm Al- Fahm suspected of helping the terrorists who committed July 14 attack. Planning took place in northern mosque. 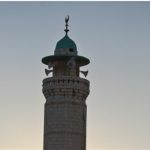 It has been cleared for publication that Amjad Muhammad Ahmad Jabareen, a resident of Umm al-Fahm, was detained for questioning within the context of an investigation by Shin Bet security forces and Israel Police on suspicion of involvement in the attack on the Temple Mount in which two policemen were murdered. Findings of the investigation revealed a local network of terrorists, which was formed in the “Al-Malsa” mosque in Umm al-Fahm, where Muhammad Ahmad Muhammad Jabarin was in charge of cleaning and the muezzin of the mosque. The findings also indicated a clear link between the Al-Malsa mosque and the northern branch of the Islamic Movement, which was declared an illegal association in November 2015 and is now considered a terrorist organization. In addition, connections were established between the terrorists and the Islamic Movement, both with respect to support for ideas disseminated by the movement and to membership in organizations that have a clear connection to the Islamic Movement. Thus, for example, Muhammad Ahmad Muhammad Jabarin was a former member of the “Murabitun” organization, which was also declared an unlawful association in September 2015 due to its activity against the security of the state in the Temple Mount compound and its direct contact with the Islamic Movement and the Hamas terrorist organization. It should also be noted that Sheikh Ra’ed Salah, the head of the Islamic Movement, spoke at the funeral of the three terrorists in Umm al-Fahm, for which he is currently being interrogated on suspicion of incitement. As part of the investigation, Amjad Muhammad Ahmad Jabarin was arrested and interrogated by the Shin Bet. During the interrogation of Amjad, an Israeli citizen from Umm al-Fahm, who was close to the terrorists, it was found that the terrorists had spoken before the attack about their intention to carry out a shooting attack and had even suggested Amjad join them in carrying out the attack on at least two occasions. In addition, the investigation revealed that the terrorists concealed the Carl Gustav weapons with which they carried out the attack in a cupboard inside the Al-Malsa mosque. The findings of the Amjad investigation revealed that in preparation for the attack, the terrorists carried out a number of shooting exercises with the weapons in their possession in a mountainous area near Umm al-Fahm with the assistance of Amjad, who also took part in a shooting exercise on one occasion. Amjad also assisted the armed terrorists and drove them on the night of the terror attack from the mosque to a collection point for entry to the Temple Mount, aware that they were on their way to carry out an attack. He then transferred the terrorists’ belongings delivered to him prior to the attack to a hiding place. Due to his significant involvement in the execution of the attack, Amjad is accused in the indictment filed against him by the Haifa District Attorney’s Office, inter alia, of the offenses of assisting in murder and activity with weapons for the purposes of terror.